From my chair our Shrine year seems to be off to a GREAT START! We have had GREAT Friday socials, our annual Valentines dinner, a successful SHRINE Circus and appreciation luncheon, a ceremonial and lots of activities by the clubs and units. Without a doubt the summer will be SHRINETASTIC! My self and Lady Carol will be making a concerted effort to attend parades and other events. Last year several of us showed the Fez riding on our motorcycles in Grandville and Grand Haven, what a good time it was. If any one rides and wants to show the Fez check the calendar and chances are good there is a parade that will work for you. The Grand Rapids Scarabs will be having Meat Fest III September 23 at Noble Roger Hekstra’s estate. Mark your calendar and save up an appetite! The Scarabs welcome all meat grillers and carnivores to attend for a day of eating and fun. Former and wanna be clowns, the Grand Rapids Clowns have been rechartered, this effort has been headed up by Greg, “Sparkey” Kiander . 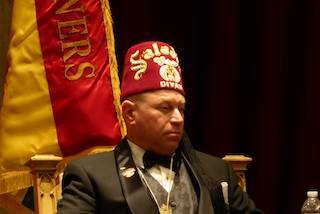 I am excited about clowning around with this merry bunch of Shriners. Lady Carol and I hope to see you at our next Friday Social.